Yes, dear readers, one of you has called me out. And I thank you for it. I have been posting a lot about neutral kitchens lately. In my defense, that is due to the fact that the overall trend with kitchen design at the moment is towards neutrals, but that is a moot point. If you didn’t understand that reference…click here immediately. So, in an effort to mix things up and give you a wider color palette to work with, I am beginning a new series of Kitchens with Color, starting with blue because it is overwhelmingly the most popular color used in kitchens. For the purposes of this series, I’m going to define traditional, contemporary, and modern being almost directly proportional to the detailing in the millwork. It can get a little convoluted to really go into how it’s defined, but the majority of the time, the more detail in the millwork = the more traditional. The least detailing = the most modern. Somewhere in between is the gray area that I call contemporary: a mix of both. Let’s start with blue used in a traditional kitchen. If you read additional design blogs, it is very likely that you’ve seen this photo before. I would argue that it’s the most popular photograph of a blue kitchen backsplash on the internet. But with good reason. Everything is perfectly balanced; the traditional cabinetry and marble countertops with the bright, glossy glass tiles and gleaming hoodfan. The cabinets emulate the windows beside them giving the illusion of an even more open and bright room than it already is. 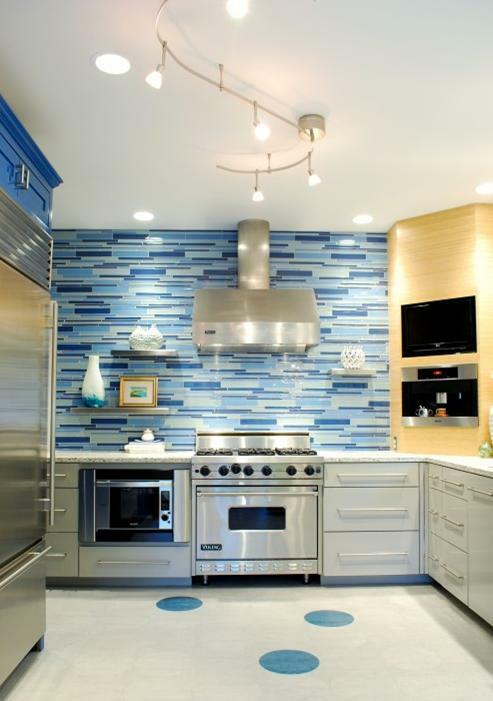 You can find a blue glossy tile similar to this from Ann Sacks, Modwalls, Artistic Tile, or Interstyle. In this series, the contemporary and traditional are very similar. The only thing that makes this kitchen more contemporary than the previous kitchen is the choice of countertop and the abundance of stainless steel. 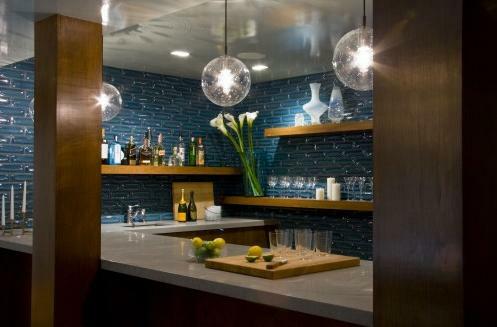 Once again, blue glass subway tiles are used to maximize the lighting in the room by reflecting it back. Even with only one window in the room, the kitchen still feels just as open and airy as the past kitchen did. 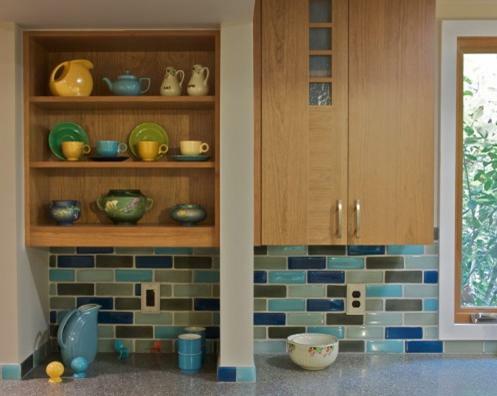 Here’s another example of a contemporary kitchen using blue tiles, this time with a heavy dose of cottage and kitschy flair. In this space, varying shades of blues and greens are used to create a fun pattern that would fit in perfectly with an arts and crafts type home. This look only works in this space because the counter is kept with a very minimal pattern (speckled), and the cabinets were left very simple. A busy backsplash like this would easily overwhelm a room that has other detailing elsewhere. This kitchen is the epitome of modern: abundance of stainless steel, minimal cabinet design, not a lot of clutter, and a very trendy backsplash. However, while this backsplash would undoubtedly be extremely overwhelming in virtually every home, it works in this space because it has such a minimal canvas to work with. 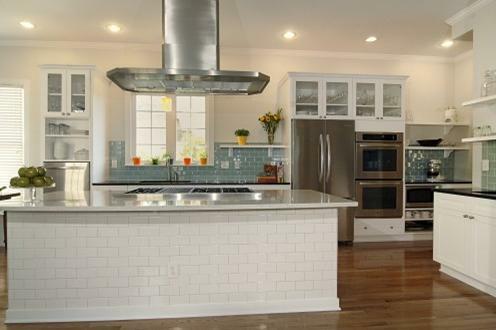 Trendy backsplashes are not something to avoid if you like the modern look. In fact, I’ve said it before and I’ve said it again: if it’s something you love, trend or not, you will still be happy every time you look at it. 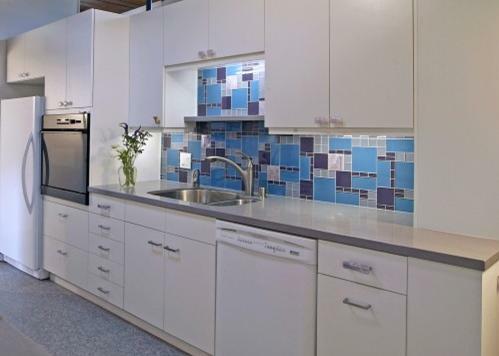 This modern kitchen uses blue glass in a fun block pattern. Because this backsplash area is so small, this busy pattern has the right balance for the space. In a larger kitchen, this backsplash would be too much, even if the rest of the room was designed in a very simple manner. Let’s look at some more fun styles, shall we? 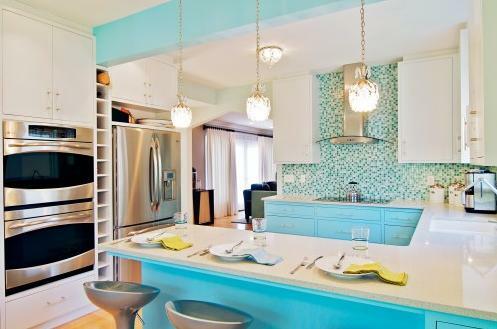 This kitchen screams “take me to the beach!” with its bright tropical hues and subtle touches of gold. I mean, I feel like I’m on vacation just looking at it. Living with it every single day would quickly get tiring, but in a vacation home? It’s perfect. The prime example of an ideal man’s kitchen. Wood, and lots of it. Dark, masculine colors. Less-is-more take on lighting fixtures. Yep, a boy definitely lives here. This picture serves as hard evidence that bachelors can have well designed kitchens without looking feminine. A little rustic charm goes a long way. 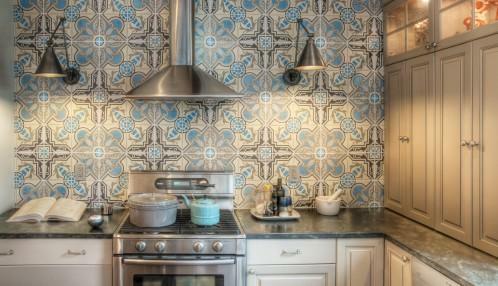 This kitchen is full of charm with hand-painted ceramic patterned tiles and soft cabinetry and lighting. Warm, welcoming, and serving up lots of personality, this kitchen epitomizes my opinion of a classy rustic kitchen. Now even with a color like blue, which I tend to treat like another neutral, there is absolutely a wrong way to go about things. Any color, no matter how neutral, still needs to both coordinate its undertones with the rest of the space AND complement its design with the space. First, there is a severe contrast in color. The cabinets and flooring are very warm, almost orangey, while the counters and light fixture are a very cold gray. 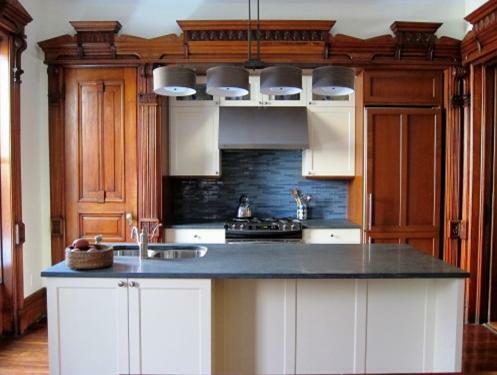 The ivory cabinets coordinate separetly with the predominant warm cabinets, and also coordinate separately with the blue tile and gray tones, but they do not all coordinate together. Second, the millwork in the primary cabinetry is exquisite; an immense amount of detail went into making them appear very traditional. The ivory cabinets are a more simplistic contemporary design, but still coordinate as they aren’t too much farther along the cabinetry spectrum. 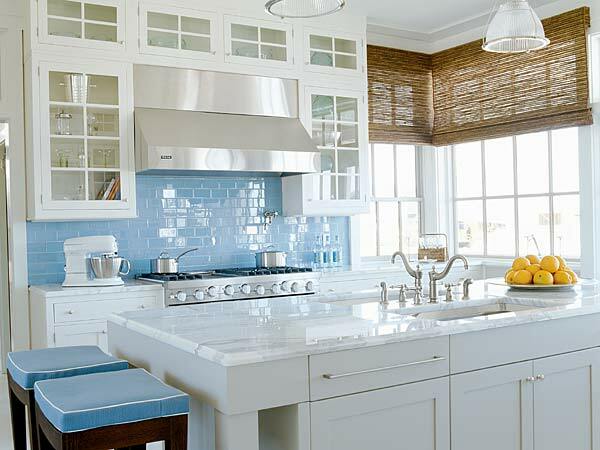 But the backsplash is extremely trendy: staggered back-painted glass in multiple hues of blue. Not only does the color not work with the rest of the room, the style of the tile significantly clashes as well. All in all, this is a kitchen fail. While all the pieces separately are beautiful, together they create a bit of a mess. Where did you get the picture of the masculine kitchen?? Love it! I know isn’t it gorgeous?! The photo is from a designer’s portfolio on Houzz.com, and the tile they used is from Heath Ceramics. I needed to send you one little word to give many thanks again about the extraordinary pointers you have documented on this page. This is quite pretty generous with you to give openly all a few individuals might have offered for an e book to earn some cash on their own, primarily seeing that you could have done it if you decided. The smart ideas as well served to be the fantastic way to know that other people online have similar interest just like my very own to realize way more with regard to this issue. I’m sure there are a lot more fun instances up front for individuals who looked at your website.